World Elder Abuse Awareness Day (WEAAD) was created by the United Nations International Plan of Action recognizing the significance of elder abuse as a growing social and financial concern, public health matter, and human rights issue. 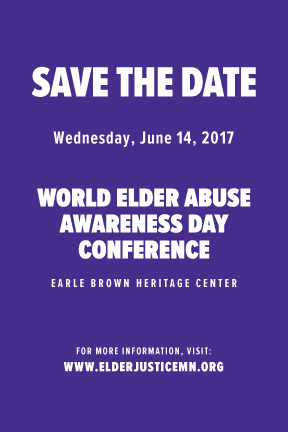 This year marks the 12th anniversary of World Elder Abuse Awareness Day in the United States and the 11th annual event in Minnesota. Each June, the Minnesota Elder Justice Center and its Center Partners sponsor a full-day professional education conference in conjunction with World Elder Abuse Awareness Day. The goal of this conference is to elevate the issue of elder abuse, neglect and financial exploitation and provide education on best practices for prevention and response. This year’s conference, Accelerating Toward Justice, will be held on Wednesday, June 14, 2017 at the Earle Brown Heritage Center. Registration is limited to 600 attendees. This conference is directed towards professionals who work with older and vulnerable adults. This includes Adult Protection Services, State Agencies, Non-Profits Organizations, Attorneys, Social Workers, representatives from the Criminal Justice System, Law Enforcement, Long-term Care Providers, and more. Jane Ochrymowycz Award We are seeking nominations for the Jane Ochrymowycz Award for Advocacy. Jane was a powerful advocate, and we seek award candidates in the spirit of her life and work. Please view our call for nominations which should include 2 additional letters of recommendation; we are seeking nominations by April 24th. Applications should be sent via email to katie.behrens@elderjusticemn.org. Presentation slides and handouts are now available! Please print out handouts and slides for your use. Those materials not available online will be provided by the presenter at the conference. CLE, POST and SW CEUs will be available, as well as a certificate of attendance for other fields. Attendees: $65.00, includes continental breakfast, lunch and coffee service. Refunds will not be provided for any cancellations. If you register and are unable to attend, you may transfer your registration to a new attendee. Exhibits will include: 1 8-ft table, 1 chair, and 1 lunch. An extra chair can be provided at no cost. Additional lunches can be purchased. Please contact katie.behrens@elderjusticemn.org for additional needs. Conference sponsorship opportunities are still available! Please use the sponsor registration form to support the work of this important conference!